Patty McCord, former chief talent officer at Netflix, talks about her new book, 'Powerful,' and what she has learned about building a strong corporate culture. Companies operate in uncertain environments. 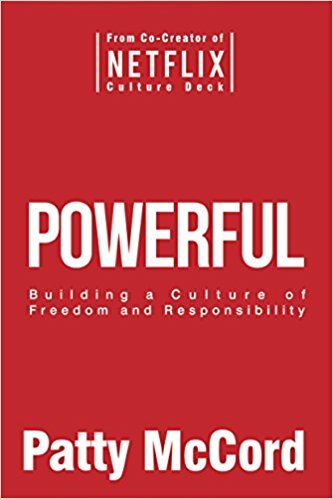 In order to confront unexpected challenges and seize emerging opportunities, they need to have a culture that balances freedom with responsibility. That is a lesson that Netflix learned as it developed rapidly as an organization where employees know how exactly they create value for customers and for the company. 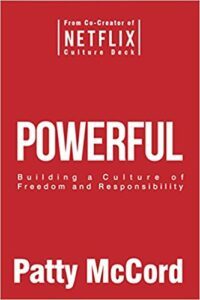 In doing so, it built an innovative culture – as described in the well-known Netflix Culture Deck — with practices that went beyond conventional notions of employee retention, annual performance reviews and bonuses, says Patty McCord, former chief talent officer at Netflix, in her book Powerful: Building a Culture of Freedom and Responsibility. In her later role as a consultant, McCord found that startups have a better chance of building the right teams and behaviors than older and larger organizations where, typically, unwanted rules and time-worn processes constrain innovation. She shared those and other insights into talent management with Knowledge@Wharton in a recent interview. Knowledge@Wharton: Before we talk about Netflix, I was just wondering if you could talk about what defines a company’s culture. Patty McCord: I’m very much a cultural anthropologist, if you will. It’s the stories people tell. It’s the way people operate when no one’s looking. It’s the values that you hold dear, that you know your colleagues do [as well]. It’s the expectations of how people are going to behave, and what gets punished and what gets rewarded. Every company has a somewhat unique culture. In retail, for example, you can look at data on what your customers are doing all over the world, in real time. Connectivity changes the way we think about work and customers. That affects culture, too. There’s an immediacy to what we’re doing that didn’t exist before. Knowledge@Wharton: Talking now about Netflix, what do you think made the Netflix culture so different? McCord: Honestly I don’t know if it was so different. Here’s the most important thing we did: We just wrote it down. So Reed [Hastings, Netflix’s CEO] and I [worked at] another company together that had a very different culture. It evolved into that generic company culture that we all seem to have. We had all the same rules and processes, and we did things the way everybody has always done them. And then we called them “best practices,” which is what happens when we copy each other. [At Netflix], we decided to write it down and to experiment a little. We just decided to pay attention to it. Knowledge@Wharton: Speaking of “writing it down,” what I have found most interesting about your book and your work in general is, of course, the role you played in the Netflix culture deck. Could you talk us through a little bit about how that came to be, how it evolved, and what role it played in shaping Netflix’s culture? McCord: We did it for a couple of reasons. First of all, Reed and I didn’t write it. It was a collaborative document that we did with whoever was in management at the time. It was also a PowerPoint presentation, so it wasn’t carved in the lobby, and we didn’t publish it in hard copy. If an employee would say, “You know, I think we could say this better on slide 17,” then we’d change slide 17. Every chapter is built on the chapter before it. The first part of it was, “Let’s write down the behaviors that we value in our teammates.” I wanted to write down “behaviors” and not “values.” It’s an important distinction, because values are aspirational. Behaviors are what you actually do. So if we value honesty, and you keep secrets, then something in the system should either punish that behavior or help reward the behavior of teaching you how to say something honestly. The next chapter was around high performance, and we wrote that after we had a big layoff. We had ended up with very few people in the company, but were focused. We realized that when we had the right people, the right focus and the right deadlines, people operated pretty independently. It was about adults. It was about them knowing what they were doing. It’s about having people who are passionate about the work that you need to get done. The actual infrastructure for making that happen – having high-performance people in every job – probably took me and HR about four years. I had to get rid of performance improvement plans, because that’s a dumb thing to do when you’re performing. I [needed] managers that were clear about the work that’s going to get done – not how you performed last year. Then I had to rethink whether or not to have an annual performance review. The whole document took 10 years to write, and we used it as an on-boarding document internally. Reed and I would meet with every 10 employees in their first couple of months of employment, and we would go over the deck with them and talk about it. Knowledge@Wharton: What are the elements of a culture of freedom and responsibility? How would you deconstruct that? What goes into creating such a culture? McCord: We very much valued freedom. We very much valued people who had good judgment and made the right calls. We wanted people to be able to do the right thing with plenty of context and make the right calls because they were smart people with good judgment. But we realized that if we used just the word “freedom,” it implied [the freedom] to do anything. We didn’t really mean to give people freedom to do anything. We coupled freedom [with] responsibility. It [also] implies reliability and deliverables. Knowledge@Wharton: I was also impressed by what you just said about the distinction between behavior and values. There has been so much focus on the field of behavioral economics, where you can nudge people into behaviors that matter and away from behaviors that are less productive. Can you give me examples of what you may have done to encourage behaviors that you valued and nudged people away from behaviors that didn’t? McCord: I’m not much of a nudger. Subtlety is not my forte. For us, it was more about spending a lot of time on clarity around what goodness looked like, and what deliverables were. When you’re clear about what needs to get done, you’re clear about who you serve by doing it. And you’re clear about when it needs to get done. That’s usually the nudge. At Netflix, we did lots and lots of testing. But there were certain things that we wanted to get done and be improved by a certain date. That timeframe drives behavior. Knowledge@Wharton: I was also very interested in what you said about talking to other companies that would like to replicate Netflix’s culture, based on the principles you’ve outlined in the deck. Is culture something that a company can create through its own volition, as an act of choice? Or do you think it has to contend with its historical legacy in the culture it inherits as part of its own history? McCord: It’s definitely both. The longer the legacy and the longer the history and the deeper the habits, the harder it is to change. I’m called upon by very large corporations that realize that they can’t innovate, and they’re not agile anymore, and they’re not nimble – and so they want to learn how to do that now. One of the hardest things about it is that at very large American corporations, in particular, everything is a global corporate initiative. There’s this value around consistency and sameness that I don’t think serves us very well. At Netflix, we would A/B test [options] … and see which one behaves appropriately. It’s not that large corporations don’t understand the need to change, because they do. Let’s take banks. Fintech is disrupting many large banks … but they want to transform the whole beast. The fintech companies are taking little parts of the beast – “I’m going to be a better liver,” or “I’m going to be a better hoof.” [Large banks] have a hard time separating those out into smaller entities. Knowledge@Wharton: How do you create teams that can work cohesively but also feel empowered and motivated – which is something that, as you say in your book, you did very effectively at Netflix? McCord: [We did that] sometimes; it wasn’t always. When we stumbled at Netflix, when things were hard, when we predicted and were sure about a particular direction that halfway along the journey turned out to be the wrong direction – which happens in all companies – you have to change gears. That’s a reality that occurs in every organization. But the secret is clarity about that end-game – about what it is that you’re trying to achieve and why. I call it “context,” or the constant setting of context. I [often tell] startup companies, “One of the most important people on your team to communicate to the rest of the organization is your CFO.” If you can teach everybody in the company how to read a profit and loss statement, then you have a capability in your company that serves you and them for the rest of their careers. They understand how it works and where they sit in the organization. Knowledge@Wharton: Is the kind of culture that you’ve written about easier to implement in a startup environment — and as a company grows in scale and complexity and size, would that be hard to preserve? At what point do you need rules, regulations and policies to manage that process – instead of just dispensing with them as you advocate in the book? McCord: If you’re in a regulated environment like banking or loans or medical or safety, then there are rules and regulations that are really critical. The problem for large institutions is that it’s not just that the rules are there. It’s the institutional behavior attached to it. I was consulting with a company the other day, and we were talking about its complex bonus structure. Each person had their own goals. Their goals were rolled out to team goals. Team goals were rolled out to department goals, into division goals, and into corporate goals. Then there was a quarterly review of whether or not the individuals, the teams, met their goals – blah, blah, blah. Then we had to figure out the payout. They always paid 100% of their bonus – every year to every employee that was still employed – and had for years. It was called a “performance bonus.” When all was said and done, what you got the bonus for was showing up to work. I had them delve in and calculate the cost of administering this process, in management time, in executive time, in administrative time, and in software time. [I said to them], “All of that time – it’s not just money – is time people aren’t working for your customer.” There is a real lack of ROI, or whatever is not ROI – like non-return on investment – of this kind of activity. Knowledge@Wharton: If you had a magic wand that you could wave in dealing with this situation, what would you advocate they do? McCord: I’d advocate they throw it away and see if there’s any difference. Put [the bonus] in pay. Stop [awarding bonuses] for a year. And see if the world as you know it doesn’t come to an end. I bet you it won’t. You’re going to … pay attention to the things that [you] were going to pay attention to, to pay the bonus. “What’s our return on investment? How’s our growth going?” You can still pay attention to those things without making it a process. In large corporations, it’s the undoing that’s hard. Knowledge@Wharton: To do what you are saying would require what you call the practice of “radical honesty.” I wonder if you can talk a little bit about what that means and how it worked at Netflix. McCord: I learned it from the engineers I work with. It’s a learned behavior. Here’s how engineers are wired: Their world is good or bad, right or wrong, black or white, zero or one. And anything in between is suspect. I learned through trial and error, when I started speaking HR-speak to them, [such as]: “Well, the system is enabled to provide you the empowerment so that you’re engaged in deliverables that will create an environment of happiness and well-being.” And they’d just roll their eyes back in their head. If I deconstruct that and write down that sentence and look at it again, I didn’t actually say anything. I learned to speak their speak. I learned to apply fact-based, data-driven behaviors. Knowledge@Wharton: Can focusing on the future help to build a culture of freedom and responsibility? McCord: Absolutely. I told a group of startup CEOs that the biggest smoke to notice in your company, or the biggest potential for fire, is nostalgia – wanting it to be the way it used to be, wanting the culture to stay the same, wanting to keep it the way it was. You have to assume there’s going to be growth and change. [You have to be] constantly thinking about where you’re going to be, who your customer’s going to be, what you need to do differently, how you’re going to scale, and how the world’s going to look. Even if we wanted our companies to stay the same, our customers won’t. The world’s going to go on without us, whether we like it or not. Knowledge@Wharton: Looking at the way in which HR departments are structured, which elements can you identify as being outdated and things that you should get rid of, and what is worth keeping? McCord: One of my favorites is the annual performance review. I don’t think it’s very effective anymore. That one just needs a big rethink. The other one is bonus programs. There’s an assumption that people work for money, and many studies say that’s intrinsically not how people get satisfaction at work. In fact, it’s just delayed gratification that usually makes people unhappy. Some of [what] we do simply doesn’t work. [For example], the way we recruit is pretty archaic. The idea of filling out a form with a list of skills and experience, and checking all the boxes in the form, and hiring somebody who checks all the boxes but doesn’t want to do it, is really broken, right? I advocate figuring out the problems you need to solve, then hiring people who want to solve those problems and are capable of doing it. That’s a different kind of matchmaking, rather than recruiting for skilled and experienced people. We’ve [also] got to dispel the myths about working that we keep saying and we know aren’t true. Companies aren’t going to keep you for the rest of your life and provide you with endless career progression. Knowledge@Wharton: It seems to me that loyalty isn’t much in evidence in the business world. And it seems to me that there is some value to loyalty to one’s team and to people whom you have tried hard to recruit. How do you decide it’s the right time to let someone go? They may thrive somewhere else more than in the environment that you’ve brought them into. McCord: There are a couple of logical ways to think about that. One of them is looking forward and knowing the team that you need to build in the future, and having clarity about that and what that team looks like, what they’re going to accomplish, what it’s going to take to be able to do it, and what’s the timeframe? Say you’re a public company, and you need a CFO. You’ve got somebody in Accounting who wants to be a CFO someday, and they’re really smart and really capable. It doesn’t mean that they won’t be a CFO someday, but probably not next year. That’s a radically honest conversation you can have. The second case is when the person is driven by an opportunity or something that they desperately want to do, and they want to have that opportunity in your company, and you just don’t have it. Keeping that person is the wrong thing to do, even if they’re amazing. You don’t want an amazing person who’s unhappy, because misery loves company. When you have a team that’s clicking and the right people are on it … you don’t need to talk about loyalty. You don’t even need to talk about engagement. It’s called wanting to wake up and come to work and solve these problems with these people. That’s where the word “loyalty” starts taking on connotations of family. Confusing those things has hurt us as employers and employees. Employees expect too much from their employers to “take care of them,” and we spend way too much time keeping people that we should just set free. Knowledge@Wharton: You referred some time ago to some stumbles at Netflix. What are some downsides to the culture at Netflix? How did you manage those? McCord: Oh, there are lots of them. The freedom and responsibility culture isn’t for everybody. A lot of people function much better with guardrails. Some people like a lot of structure, and they like working within the structure – particularly early in your career. So when you don’t know what the consequences are, and you don’t know where the walls are, you jump off cliffs a lot, unintentionally. So that was hard. Having very senior people come from other rigid companies into the culture and deprogramming them was [also] hard. One important thing about the Netflix culture deck is we wrote it as an internal on-boarding document. We didn’t write a manifesto. We tried some stuff. Some of it worked really well, and some of it didn’t work very well. Some of it scaled, and some of it didn’t scale. But you won’t know if you don’t try.